The Melbourne Cup has always been the aim for talented imported galloper Araldo and he took a step closer with his victory on protest in Saturday's Listed Bart Cummings at Flemington. Part of a thrilling finish that saw three horses - Sea Moon and Gotta Take Care the others - nose to nose over the final 200m, Araldo was game in defeat having being laid in by initial winner and fellow import Sea Moon. It was that interference coupled with the narrowness of the winning margin that saw stewards uphold Glen Boss' protest - much to our delight! A Group One placed winner in Germany, Araldo has shown improvement at each Austalian outing - first up finishing 15th in the Heatherlie Handicap over 1700m, a game and somewhat unlucky third in the Tokyo City Cup in Adelaide second up - and a winner third up, appreciating the step up to 2520m. Hopefully Araldo's win will see him earn a weight penalty for the cup, the horse currently sitting 74th in the order of entry. "But we have a few more cracks at getting in," Moroney said - noting that the Geelong Cup and the Lexus Stakes (a race the stable won with Melbourne Cup winner Brew in 2000) are both suitable contests for Araldo. 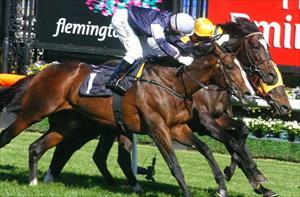 "I thought his run was terrific," said Moroney. "He was posted three-wide for most of the trip and he just kept trying." Rating the protest a "50/50 call," Moroney was not surprised when things went Araldo's way - "I think if it had been a long head they probably would've left it. But it was a nose and there was enough proof that it cost him the race." Raced by R & C Legh Racing Pty Ltd (manager Rupert Legh), GG Syndicate Ltd (manager Gerard Peterson), R Smith, Gerry Ryan, Roberto Scheriani, Constantine Andronis, George Kaparos, Dr John Kennedy and the Wright Racing Syndicate (manager Peter Wright), Araldo is a son of High Chaparral. A 3/4 brother to the three times Group winning European Altano, he hails from a strong German family with plenty of stamina in its ranks.